Before getting into the latest project let me summarize what Diane and I have been up to this crazy and exciting year! After a 20th. anniversary celebration of living in Scottsdale for 6 months we decided to sell our home in Las Vegas and move to Phoenix. For Diane, the purpose was to be close to the Scottsdale Artists School and the generally more art oriented environment. My objective is similar for my furniture work and also finding a group of artists to make “boutique frames” for. Someone needs to fill the niche between the multi thousand dollar frames most artists can’t afford and the big box crappy ones. Another big plus was that this house already had a free standing shop of sorts. It has taken some time to get it to my liking and you can read about some of it here. So, to make what could be a very long (and boring) story short I began to look for a suitable molding; one that was wide (3″-4″), could accommodate stretched canvas, and had a panel that had space and a contour that could be carved. I searched the few raw molding suppliers on line and checked with Foster Planing Mills in So. California who we had used before but shipping would be a killer. 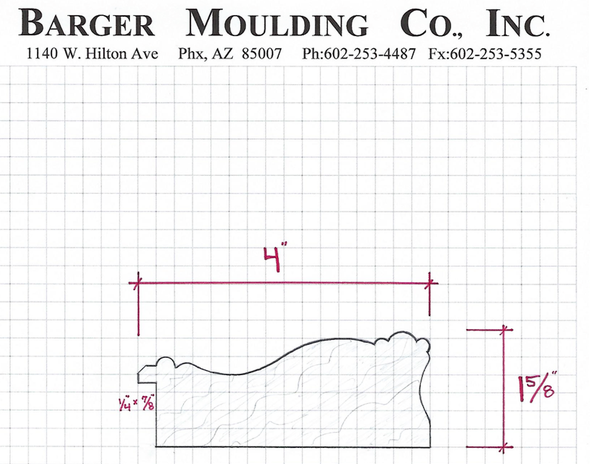 Then I learned about Barger Moulding and ended up designing and ordering 100′ of the profile we designed. That’s the reference in this blogs’ title. If it’s worth doing or if you can’t find what you want you either do or make it yourself. This profile is called Woodworks by John #1. Enough background, let’s get into the first frame currently under construction. A few months ago, while we were in the middle of our move; I received an email from someone on the east coast. It was from a gentleman who had seen my website and was interested in having a frame made for a painting he had recently purchased. My first reaction was a slight panic — I’ve been wanting to expand my custom frame work and here I am without a shop and in the middle of what we called our “Real Estate Hell”. We had a few emails back and forth and thankfully he is very patient and willing to wait until the new shop is complete — thank God! 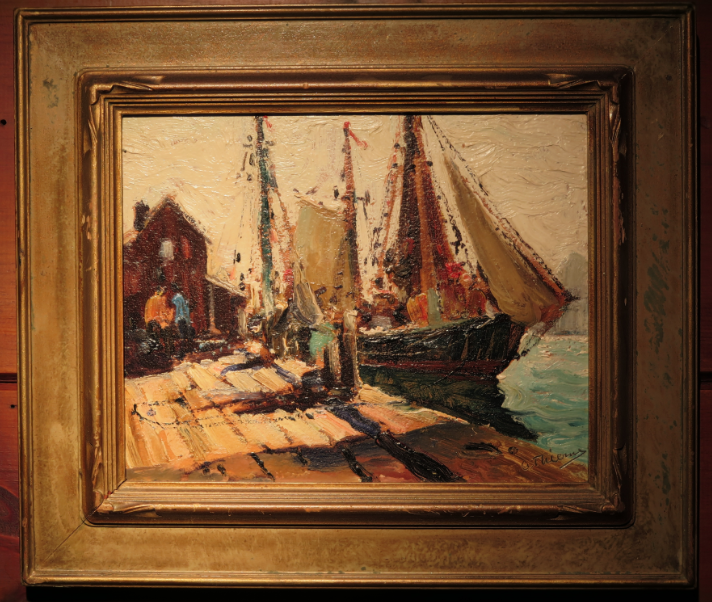 It was interesting to see that the artist, Anthony Thieme; is someone who like me, came from Holland! Here is an image of the picture my client bought along with the frame it came with. Along with this image he also sent an image of the style of frame he would like to have for this piece. This design is more fitting with the carved waves on the panel. Obviously, this painting is much larger than the size of his painting. He also asked for molding to be wider, somewhere in the neighborhood of 4″ which is what the new, Woodworks by John#1; his frame will be the first to be made from my custom molding design! 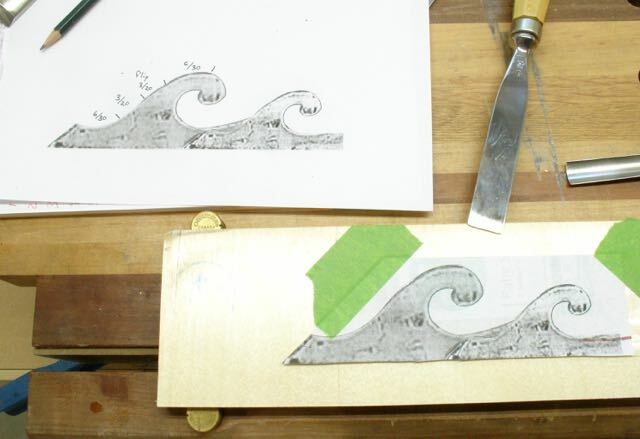 Next is the the actual carving on a corner sample. I was anxious to see how this Basswood from Barger would cut and am impressed with the quality of the wood. Using the plastic for the pattern makes it easy to flip and get that mirror image on the corners. The line on the outer edge of the molding indicates the center on each leg. Yep, I’m in my “happy place”, in front of the carving bench lost in making the design come to life! 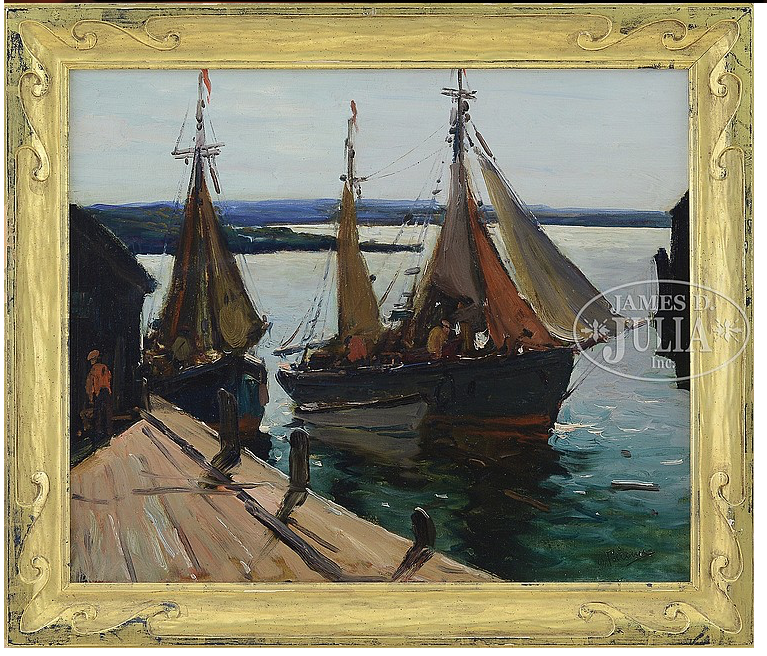 This entry was posted in Picture Frames and tagged Anthony Thieme, Barger Moulding, custom frame molding, Foster Planing Mill, Frame design, hand carving, Ocean Waves frame. Bookmark the permalink. 5 Responses to Want it done right? — Do it Yourself! Nice to see you making chips again John! Forgot to mention, it looks like a great profile that you came up with – countless possibilities! Thanks John, seemed like all of the “stock” profiles I found didn’t lend themselves to much carving. Appreciate you following the blog! I bet it feels good to be making something again. Seems like a big frame for an 8×10 photo. But its the customers wants, wouldn’t talk him out of it!